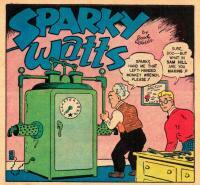 Final issue of Boody Rogers’ Sparky Watts, released April, 1949. Doc Static invents a machine that doubles anything—or anyone—placed inside. In the second story, Sparky, Doc, and Slap Happy use the rejuvenating Life-Lite on the mummy of King Tutty-Tut-Amen. 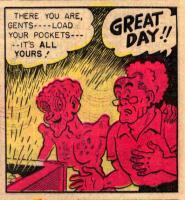 The inside front cover features a Cranberry Boggs strip by Don Dean. Scans and edits by Ryan McSwain. Comment: Many thanks for this your first scan for us Ryan. Great to see the hole finally filled in our collection. I hope it the first of many down the road.